charity: water is a nonprofit organization on a mission to bring clean and safe drinking water to every person in the world. The team uses 100% of public donations to directly fund sustainable water solutions in communities in need, and have raised over $200 million in ten years to benefit over 6.4 million people in 24 countries. charity: water is known for using technology, social media, and data to run a sophisticated fundraising operation and galvanized grassroots campaigns. Nearly all of their donations come through online channels, so optimization is crucial to maintaining and growing revenue year over year. 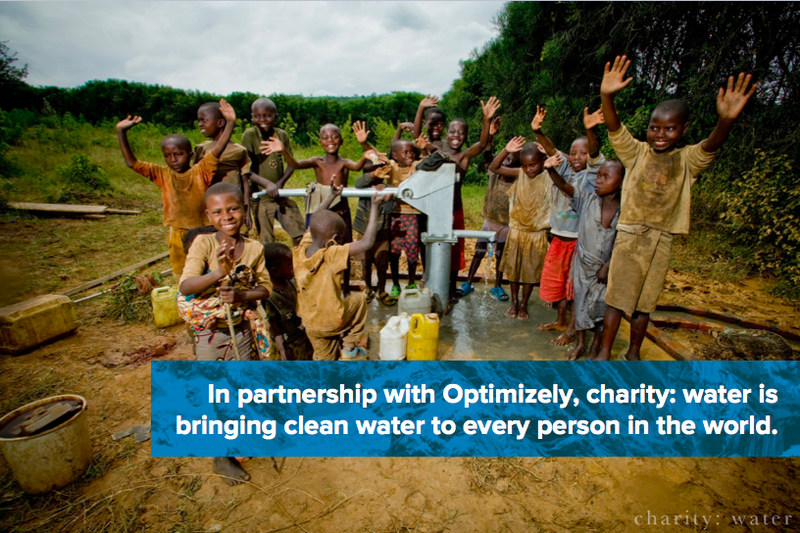 Most of charity: water’s donors give only once. In order to maximize one-time donations, the team experiments with their website funnel’s messaging, UI components, and pre-fill amounts. They also test other product features to mobilize individual-led campaigns and grow their base of monthly donors to set up a future of recurring revenue. When a visitor makes a donation, they enter how much they’d like to give in a box before providing their payment information. 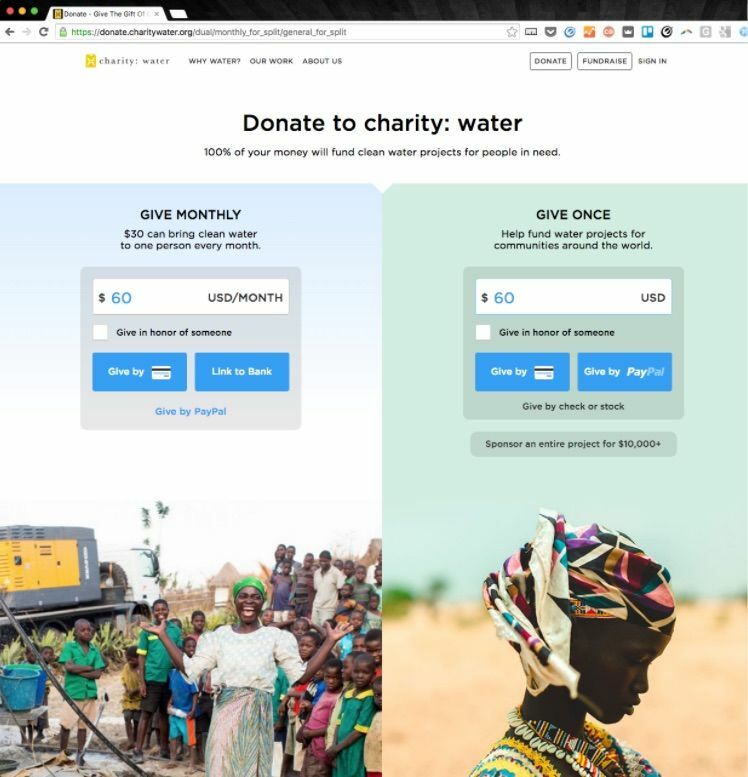 charity: water pre-fills the input box with a suggested donation amount, which used to be $20 or $30. The team experimented with increasing the amount to maximize the total money raised and found that a better pre-fill for average donation size without reducing conversion rate was $60. Does matching motivate people to donate? From time to time, charity: water matches public donations through another donor. 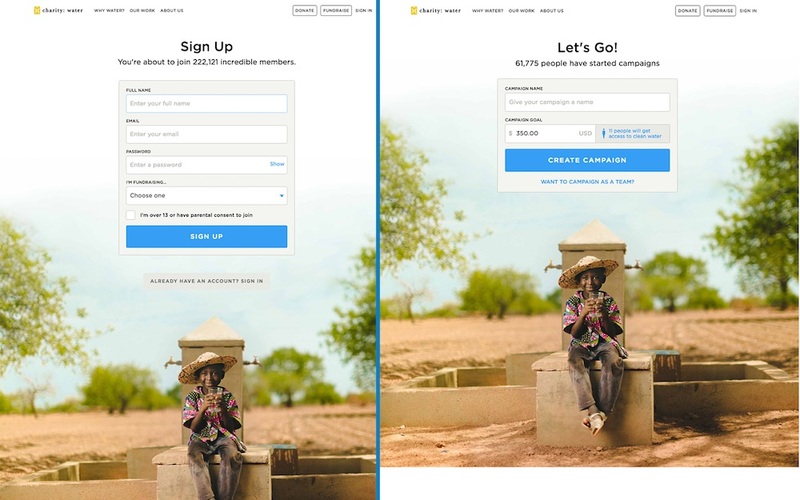 The team tested whether this motivates more people to donate, and were surprised to find that matching didn’t get more people to convert and the overall number of visitors who pushed the “Donate” button stayed the same. However, an experiment run over the holidays showed that the average donation size increased by 30% while a match was offered. “When people who are [initially] willing to give $50 actually give $65, it scales up into millions of dollars over the whole year of donations,” said Scott. From day one, charity: water has leveraged the power of social connections (and social media) to bring people into their cause. They were one of the first nonprofits to embrace Snapchat and Instagram, and a central part of their fundraising culture is campaigns led by individual evangelists who ask their friends and family to donate. For example, 170,000 people have created birthday campaigns asking for charity: water donations instead of birthday gifts. The team experimented with the sign-up flow to start a campaign and saw drop-off on longer flows. So they tested a very short flow that collected much less information and was designed to be less intimidating. The result was a 34% increase in clicks on the “Create Campaign” button. “[This was a] huge, huge win for us. We would have never thought that collecting this amount of information would have deterred people,” said Scott. Most individual donors find charity: water, give a gift, and move on. As a result, the nonprofit needs to find up to 85% new donors each year—or, they must invest in programs that keep these community members engaged for recurring revenue. “The key business challenge for us right now is more repeatable, sustainable revenue so we don't have to start over every single year, and to give an amazing experience to these people with virtual reality and media to bring the stories closer to the donors,” said Scott. To that end, charity: water is experimenting with a program in which individuals give monthly to fund clean water projects and sustainability. Even if the donation amount varies—donors can give at any level they are comfortable with—what matters the most are the long-term relationships that are created. We're trying to build a team of people who can step into the next 10 years with us as we hope to make an even bigger impact. Insights from Optimizely have helped us radically raise more money—millions and millions of dollars online over the years.